Bake My Day! : This Blundering Babe is Bitten By a Croc! This Blundering Babe is Bitten By a Croc! 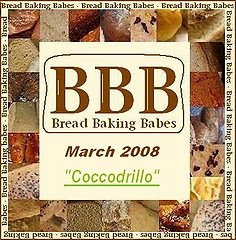 For perseverance and endurance, beautiful breads and stamina, please go and visit my Bread Baking Babe Sister. What I show you here is just a mediocre miserable excuse of a bread. "This bread, named for its shape, was dreamed up about thirty years ago by Gianfranco Anelli, a baker in Rome. It is his favorite bread and, judging from the numbers of people who come from all over the city to buy it, it may be his most popular as well. At the bakery it takes two days to make; I suggest that you start it in the morning, work at it again for ten minutes in the evening, and finish the next day. I actually prefer to stretch the process over three days because the flavor is even better. Three days may seem formidable, but the working time of the first two days is only 5 to 10 minutes. This is one dough that you will find difficult to make without an electric mixer, for it requires thirty minutes of continuous stirring for the final dough-of course you could enlist help. The result is an extremely light bread with a crunchy dark-speckled crust and a very chewy interior. The bread stays fresh for an amazing number of days." Wasn't shocked by the mentioned three days, not intimidated by the two separate starters, not even terrified by the thirty (30!) minutes stirring by hand (less when you use a stand mixer, but O.M.G... this was no dough, it was soup, the blobbiest of blobs, impossible to shape and fit to be tackled by Uri Geller I think. A mentalist good do some healthy work here to keep this monster at bay! (I do hope Lien is showing her hand magic with two bench scrapers). You can find the recipe in Dutch and in English in her Kitchen. All I have to show you are these two pics, it disappeared too quickly to take anymore. Besides, I wanted to make it again, thinking I had thoroughly ruined this bread. See, I made the first starter, incorporated the first into the second starter the next day. Building confidence to tackle the dough on the third day. Put it to proof. Only to be reminded by the big bowl in a warm spot in the kitchen at 11 pm! Pyjama-clad all ready for a nice last read in bed.... No way I was going to shape, rise and bake that monster blob that night. I dumped it rather unceremoniously on a well floured lined baking sheet, performed miracles with two bench scrapers and my hands. (Yuck!! ), divided in half and flipped each half over to one side. Then searched for the biggest plastic bag I could find and tented the whole thing. Shoved it in a corner, kissed it goodnight and went to bed..... Knowing all too well that this was going to be a large sticky failure. Already prepping myself I had to do this one again. So..the next morning I silently tiptoed into the kitchen as to not disturb my croc. Fully expecting it to leash out at me, punishment for severe neglect. What I found was a even larger blob, spread out a bit, but altogether not too bad. Decided to bake it anyway. Somehow between that first bread, and the hilarious exchanging of mails and forbidden words (do you know how many names this bread got called the past weeks?) I never got around to baking one again. Something got in the way, life perhaps or maybe I just didn't feel capable enough to tackle a croc. Call myself Sheila and get a proper Aussie hat first maybe. For now I feel I'm a Joey. Oh and I did use my regular bread flour and some durum flour although the recipe asked for high protein flours from hard wheat. I guess I was a bit like Katie; if it can't be baked with what I have...too bad. After all; considering how I mishandled the dough, viewing the gorgeous breads my fellow bakers turned out and seeing what this bread is supposed to look like, I don't think it is too bad. 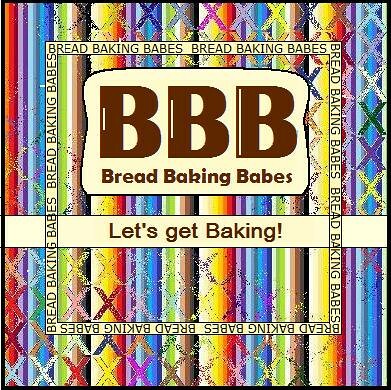 Don't forget, you can become a Bread Baking Buddy again this month! How? Read all about it here, or in Dutch here. I always have to laugh out loud reading your stories.... laughing with you that is, not at you :)). Your croc looks good to me from above that is. Like I wrote somewhere else, it's a croc family, not everybody looks the same but they still love each other. You're lucky nothing happened with that sleeping (or was it?..no missing kittens, cats, boys?) croc in your kitchen! O no I didn't video the magic scraper thing in my post... maybe I can add it somewhere (takes forever to download), I'd never stick my hand in a croc in a million years! Thank you Karen for writing about it with the fun it really was and is. Oh my that backside just keeps coming at us!! OK especially for you karen... the video of the dough scrapers in action is now on! You are very funny! I think your bread looks very good. Hope you try it again though, I know I will. Karen, you crack me up every time I read your blog. I can see you with a stunned look on your face when contemplating this dough. Heck, I love that you don't even realize you have the perfect croc just sitting there grinning at you. AS usual, had a blast baking with you. Haha-ha, thank you for a hilarious bread story! And your bread looks exactly as nice and croccy as everybody else's! You left it unattended... Overnight!?!?!?! I would have been afraid to go in my kitchen... very, very afraid. Yours had nice big holes in it... Maybe I should have left mine overnight. No, I have visions of it running down the sides of the boiler, into the dog dishes. I'm loving your pictures. And your crocs have the exact same brown spots on them as mine! What is that all about? :):) And totally forgot about the song Crocodile Rock! Now I'm singing it. Karen--I love that, like me, you like telling the tales of all the things you THINK you don't do very well. It makes me laugh and know we're dancing in the same puddle--Love your bread and the underside was very cool looking!